Varberg passenger and car ferry ticket prices, timetables, ticket reservations and information for ferries sailing from Varberg to Grenaa. Compare all available Varberg ferry ticket prices in real time and book the cheapest available Varberg car and passenger ferry tickets sailing to and from Varberg, Grenaa with Stena Line ferries online with instant confirmation. Book Varberg Ferry Tickets with Stena Line for ferries sailing from Varberg to Grenaa online in advance to enjoy the cheapest available ferry ticket price. The price you see is the price you pay. There are no hidden extras or surprises such as added fuel surcharges or booking fees and we do not charge you anything extra for paying with a Visa Electron card. The price we quote you for your selected Varberg passenger or car ferry ticket, onboard accommodation and vehicle type is all you will pay, and that's a promise. To obtain a Varberg ferry ticket price and book your ferry ticket securely online please use the real time ferry booking form on the left. You are also able to add a hotel at your destination, or anywhere else, to your ferry ticket when completing your ferry ticket reservation. Varberg is an popular seaside resort and spa on the west coast of Sweden. Not too many foreign travelers make their way to Varberg when visiting Sweden. Those that do usually go to see the Havsbadet. Otherwise travelers visiting the area generally stick to more well-known destinations such as Stockholm and Malmo. There is no airport in Varberg except for a small landing strip used by private jets, nearest international airport is in Gothenburg which has flights from most airport hubs in Europe. A twice-daily passanger ferry by Stena Line connects Varberg with Grenå in Denmark. The city center is easily accesible by foot. Other options are bicycle and car. There is a public transportation net but not very good. Comming by rail, Varberg is along the line between Gothenburg and Copenhagen via Malmö with plenty of departures, every hour during the day and more often during mornings and evenings. Travel time from Gothenburg is 40 minutes an three hours from Copenhagen. Connections is also avalible from Borås with six trains daily. There are no direct trains from the capital Stockholm, a change of trains in Gothenburg is necessary. Kallbadhuset is a beautiful wooden bathhouse in the ocean near the city center open all year round (has saunas). Varberg's Fortress (Varbergs fästning) is an old castle close to the city center. Parts of the castle are open 24/7 while one needs to be in a guided tour to reach other parts. Getterön a former island (now connected to the mainland) 2km northwest of Varberg with a bird station and several nice beaches. There is also a beautiful area in the west part. Varberg also has some of the best wind surfing in Sweden, with a surf centre located in Apelviken. The centre offers rental surf boards and it has a café that's open day time. Next to the center you find the restaurant "Majas vid Havet" [Majas by the Sea] which offers excellent food and wine. They're only open in july, and they put on concerts practically every night of the week. Ullared (30km east of Varberg). Ullared is a small town original famous for a huge store called GeKås. Now days the whole town is a mega mall. Worth to experience! Sea Angling - Varberg Sea-Angling Competition is in May. It is one of the largest competitions of its kind in the world. Torpa - A rewarding side trip is to Torpa, to the north of Varberg, which has a medieval church with a 14th century font and 18th century ceiling paintings. The wooden tower points to the east. Torstorp - Rock Carvings and Cemetery - To the east of Träslövsläge, at Torstorp (golf course), are modern rock carvings - some 130 proverbs cut from the rock in the early 19th century by a local landowner named Bexell. Varberg has several different restaurants and bars serving food. It also has a fish shop in the harbour for those wanting to make their own meal. Apelviken, a short taxi ride south of the city, offers a wide range of food, with 4 popular restaurants spread out along the sand strip. "Solviken" attracts mostly customers from the nearby camping. "John's Place" is famous for it's fantastic location - on the beach - and it has a good but pricey Bar-B-Q. "Majas vid Havet" is well known for it's concerts with major swedish pop groups, their good food and nice atmosphere. Be sure to order their tender ribs. The shooting star is "Olles", a small and very popular outdoor restaurant in the south part of the bay. They serve good food at great value. Best Price Guarantee - We always offer you our lowest available Stena Line passenger and car ferries ticket price to and from Varberg. There are no hidden extras or surprises such as added fuel surcharges or booking fees and we also we do not charge you anything extra for paying with a Visa Electron card. The price we quote for your selected Varberg ferry ticket, onboard accommodation and vehicle type is all you will pay, and that's a promise! In the unlikely event you find the same all inclusive Varberg ferry ticket cheaper in the brochure of any other tour operator we promise that we will do our best to beat that price or offer you the choice of requesting a refund. 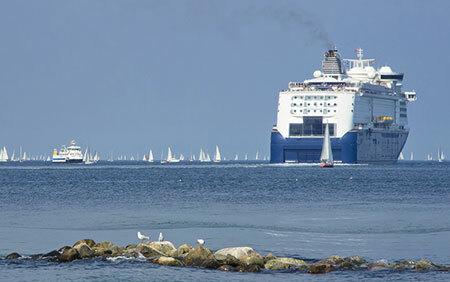 To book Varberg car and passenger ferry tickets please click here. At ferryto.co.uk you are able to obtain live Varberg ferry ticket prices, check availability and book car and passenger ferry tickets to and from Varberg at our lowest available ticket price. Ferryto.co.uk is part of the world's largest online ferry ticket distribution network providing the ability to book over 80 major European ferry operators including to Varberg and to over 1,200 other ferry routes throughout the UK, France, Spain, Ireland, Holland, Eastern Europe, the Mediterranean, the Baltic and North Africa.